SUNY Oswego faculty member Juliet Forshaw (left) and duo partner Michael Judge (center) will perform as Avalon with alumni bassist Taylor Ricks in a Focus on Faculty Series concert in Sheldon Hall ballroom. The Focus on Faculty presentation, titled “Juliet Forshaw & Friends,” will take place at 3 p.m. in Sheldon Hall ballroom. The performance will feature original songs written by Forshaw and Judge, who perform regionally under the name Avalon. Avalon, an acoustic duo based in Oswego, performs original music that blends folk, classical and musical theater styles. Their lyrics explore the highs and lows of life through myth and fable. Their debut CD “Avalon” was released in 2017. Their second album, “My Evil Plan,” is slated for release in summer 2019. 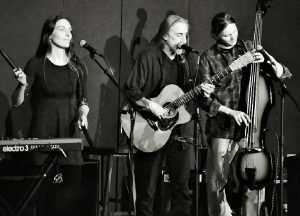 The duo has performed at area venues and festivals such as the Buzz Café and Funk ‘n’ Waffles in Syracuse, the Wooden-Apple Farmstead in Palermo, Porchfest in Oswego, the Peony Festival in Baldwinsville, the Rockland Music Festival in North Rose, Unity Hall in Barneveld and the Hook Songwriter Series at Oswego Music Hall. When they are not writing and performing, Judge directs the Open Mic Friday series at Oswego Music Hall and Forshaw — who has a doctorate in historical musicology from Columbia University — teaches music history and literature courses at SUNY Oswego. Tickets are $8 ($5 for SUNY Oswego students) and will be available at the door. For more information, call 315-312-2130.